In a matter of days, the human race was reduced to nothing more than vicious, flesh-hungry creatures. Criminal defense attorney Samson struggles to keep his family safe and his sanity intact when the world comes apart at the seams. Veronica, the high school track star, races to get her brother out of their doomed city. Ben, a military veteran, is forced to come to grips with the end of the world as he fights the undead. Having barely escaped the clutches of the undead, the survivors of The Breadwinner are headed into the unknown to continue their search for solace in the post-apocalyptic landscape. 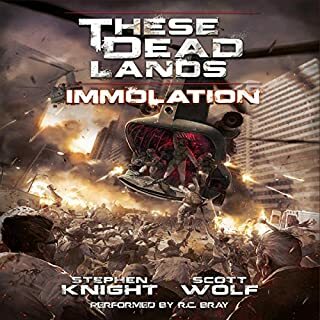 Once a paradise for the living, the city of Haven is now crawling with flesh hungry creatures; yet it could be their only hope. Veronica, Samson and the others take a chance on the promises of Gary, a solitary survivor. Is the light-hearted newcomer all that he seems or are there sinister motives hidden behind his hospitality? Can Michelle and Lulu, two ordinary women faced with extraordinary horrors and obstacles, make it to safety? Or will they each become just another undead face in the hordes roaming the streets of Haven? When tragedy strikes, worlds collide, and the survivors must band together against their common enemy. But remember, who you were does not determine what you will become in the face of a catastrophe. The dead may no longer be their greatest threat. Welcome home. Haven is hell. While I loved book 1 of this, I found this one to be so much better because we have more character development, which I loved. This is told from 2 different groups, group one being the group we know and love from book 1 and group two being a new set of characters that have secured a shopping mall and are trying to survive any way they can. At the end of Breadwinner, we left Veronica, Samson, Ben, Andrew, Clyde and Juliet on a boat and this one starts where the gang wake up one morning to see they are near a holiday village called The Emerald City. This used to be a place for the wealthy to go. When they come within view it's to get a glimpse of life on a balcony. They don't know what to make of it but decide to wait and see. Next thing they hear a ski jet coming and a man pulls up beside them. Enter the ever happy Gary. He tells them his tale and the gang decide to go to the towers since their supplies are low. It seems to be a safe enough haven for them for a while. They have to venture out though to see if there are any other survivors and get a bit of ammunition. Meanwhile, we get to meet Michelle, Lulu and her cousin Zack, whom Michelle spent the night with. When she wakes up it's to chaos and the realisation that the Undead walk the earth. Michellee decides that in order to survive, they need to leave their apartment and find somewhere safe. They decide that the mall where they work could be the safest place and take the trek, not everyone makes it though!! When they reach the mall, they meet up with Katherine, Desmond and Francis, 2 doctors and mall security. Together they all get the mall into relative safety. Now I'm not going to get into the plot anymore because I will inadvertently spoil something, but suffice it to say that there is death a plenty, so let's get down to my thoughts. As I said already, this has so much more character development than book 1 did. We get to really see more of who the characters are and what they are like. Most of them are normal humans, intent on surviving, but needless to say, there is always the one!!! This character was malicious, self absorbed and an all round horrible person. This character causes so much heartache that I can only hope there is things in the future for this character!! (I don't want to spoil it by saying who ;)) It's been a while since I hated a character so much but he/she is so well written that it's hard not to. I'm presuming that it was the author's intention for the readers to hate him/her!! The plot of this one is fast paced and intense. I found myself on the edge of my seat a lot more than book 1 and I was gripping the arm rest during certain scenes. We also have a lot of weepy scenes!! True to the authors style, she isn't afraid to kill off characters, and some of them broke my heart. In all this was an amazing second book. With so much happening in the story, it was so hard to stop listening to it. I just had to see what happened next. There are plenty of twists and moments that will leave you gasping and this ends in the mother of all cliff hangers!! I was left reeling. Book 3 can't come quick enough. Scott Birney did a great job though I found his female voices to become annoying over time. I think that since this is heavy on the female side of things that maybe a female narrator would of worked better. Now don't get me wrong, the narrator was really good at the other voices, just not the female ones. Also I thought he could of made the pacing a little faster in places, especially in the tense parts, just to add that little extra sense of urgency. Haven is Hell - Hell Yes! What did you love best about Haven? The unknowing. OK, with a typical zombie apocalypse novel you have zombies that attack people and survivors are in a survival mode. Ok, I get it. In "Haven" dealing with zombies and survival all applies. What makes this book different is how all of these distinct personalities handle this new world. Two of the main characters, Veronica, and Michelle are opposites in good and evil. This novel has taken directions that were surprising and even shocking. So what I best loved about Haven? I did not know what was going to happen next. What other book might you compare Haven to and why? First of all, I would read/listen to "Breadwinner" which is the first book of the series. This will help to get a better feel for the characters, though "Haven" can stand on its own. I would best compare this book to the "Living Dead" TV series. Good characters, good story line, always uncertainty. . 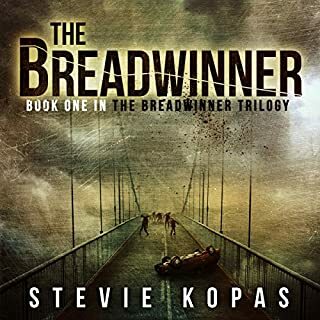 I listened to the first book of this series, "Breadwinner", which Scott Birney narrated. Scott brought these characters to life. There was somewhere in the order of ten different characters Scott performed. In my minds eye, I could see these characters very clearly. Usually, when you try to perform an opposite gender, it may not come off as realistic. In this case, Scott's voicing of the ladies, came off as very believable. I really enjoyed the North Florida redneck accents. Yeah, my reaction is to beware of crazy women. Read this book and you will know why. At least zombies are honest about their intentions. 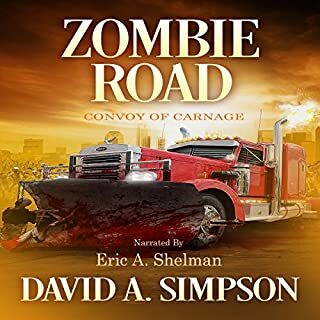 This audiobook was provided by the Stevie Kopias free of charge in exchange for an unbiased review via AudiobookBlast dot com. I am a fan the "Living Dead", and remember seeing "Night of the Living Dead" back in the 1960's. Even before this I saw a B grade movie about zombies walking underwater on "Voodoo Island" in the 1950's. "Shaun of the Dead" was great, as well as the "Resident Evil" series, and "28 Weeks Later". I did not particurally like "I Am Legend", or "World War Z", since I don't think the zombies were that believable. Currently, there are over 200 Zombie movies shown on Wikipedia beginning in 1932 to today. There are a couple of points here. The zombie genre has existed for 85 years and is going strong. Many Army Navy stores have a section of items for sale in case of zombie attacks. In fact two years ago the most popular bullet series sold was the Zombie Max line of bullets by Hornady. The second point is that somewhere in our psyche we are afraid of getting overrun by vast hordes of invaders. Pick your group, Huns, Russians, Chinese, Muslims, right wingers, Mexicans, criminals, a racial group other than yourself, etc. This fear of invasion by outsiders is endemic to the human condition. Which makes a zombie apocalypse a natural fear many people may harbor. 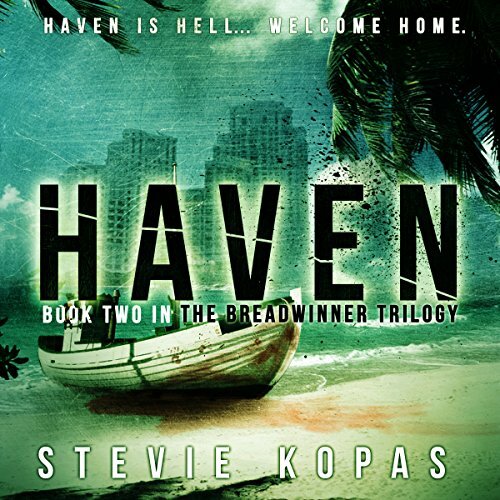 Author Stevie Kopias taps into this pysche with her story line. How do you survive? Who leads? Who should you really be scared of? Who do you trust? The reality it is not the zombies you should be scared of, it is the other people. Yes, Haven is Hell, Welcome Home! I do not like how Michele changed therefore I have no desire to read book three for now. Maybe later maybe not at all. If you could sum up Haven in three words, what would they be? 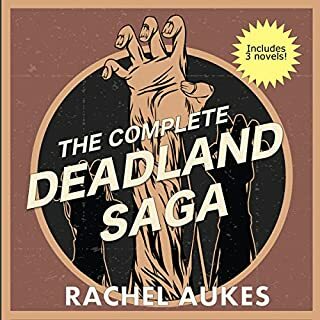 This series is perfect for readers/listeners who are fans of zombie characters.! 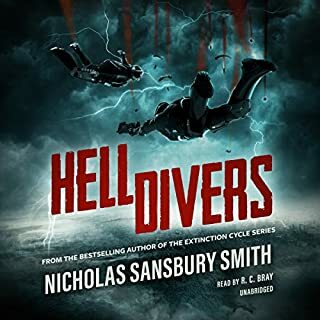 The author hits every horrific turn with this book She puts the survivors through HELL, exactly what they would be going through during a true apocalypse scenario! I can't wait for the third book to this series. It is refreshing to return to the traditional zombie genre! No alien races... no good verse evil supernatural beings... no secret organisation behind the end of the world. Just good old-fashioned character development in a zombie outbreak. Character development is what this series has in bucket loads. Notice I used the term 'zombie outbreak'. This story continues in the same way as the first in not using the 'z' word. Not once has the term zombie been used. Why is that that? It feels weird to me. Sadly my only real gripe with this series continues in the fact that the $ per listening hour is just not there. I mean the narration is slow and can easily be sped up to 1.5x speed. 1.25 is ok. This dramatically decreases your listening time. So once again today I found myself spending $13 on a story which didn't even see me though my working day. Heavy listeners on a budget may be put off by this. I still think this book could have been rolled into the first one. That would have made it a 13 hour title. I know if that was the case I would be feeling a lot better about my purchasing decision on this one. I know I mentioned that the narration was slow, but still very pleasing to the ear. The speed can always be increased so that in it self is not a drama. Not two thumbs up, but one thumb up with a stupid grin on my face! SUPER GREAT...CANT WAIT FOR BOOK 3! I wont say any were my fave, because this is a dark story, but I will say the most memorable was when Samson sacrificed himself, and the end where Michelle commits another murder...they need to get rid of her! Yes it was! and I practically did! This book picks up where book 1 leaves off, Our group finds themselves at Emerald Isle...a resort island where they meet Gary. Gary had been alone for awhile and welcomes our group....they go out on a supply mission...and run into another group of survivors...where they Meet Michelle who unbeknownst to anyone is a Psycho....and I hope they figure it out soon..because I hate her!! LOL In a zompocalypse its really the living you need to fear! Cant wait for book 3!! I RECOMMEND ANS CANT WAIT FOR BOOK 3!!!! Much more straightforward story now, good combination of death and action. Yet another crazy chick to spice things up. But the craziness just doesnt seem motivated. Still, have to finish the trilogy now, in for the third book then. Stevie Kopas has done it again. I really enjoyed this story from start to finish. Its filled with action, death, and survival. The story has it all and its a must read or listen to. 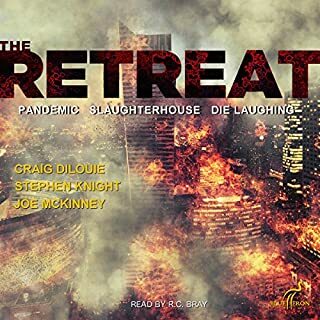 The narrator Scott Bimey did a great job. He kept me immersed in the story. I think I liked his accent of Gary the most. Overall, a perfect 5 star rating! Couldn't put down the first one and the second one did not let me.down. Waiting for 3rd book with baited breath. I would recommend to anyone wanting a good book to read. What made the experience of listening to Haven the most enjoyable? The way it was told. Characters and writing. Which character – as performed by Scott Birney – was your favorite? Received for an unbiased review.